In this Free CCNA Lab we will use Packet Tracer to troubleshoot a simulated network that was designed and configured to support five VLANs and a separate server network. Inter-VLAN routing is provided by an external router in a router-on-a-stick configuration. However, the network is not working as designed and complaints from your users do not provide much insight into the source of the problems. You must first define what is not working as expected, and then analyze the existing configurations to determine and correct the source of the problems. 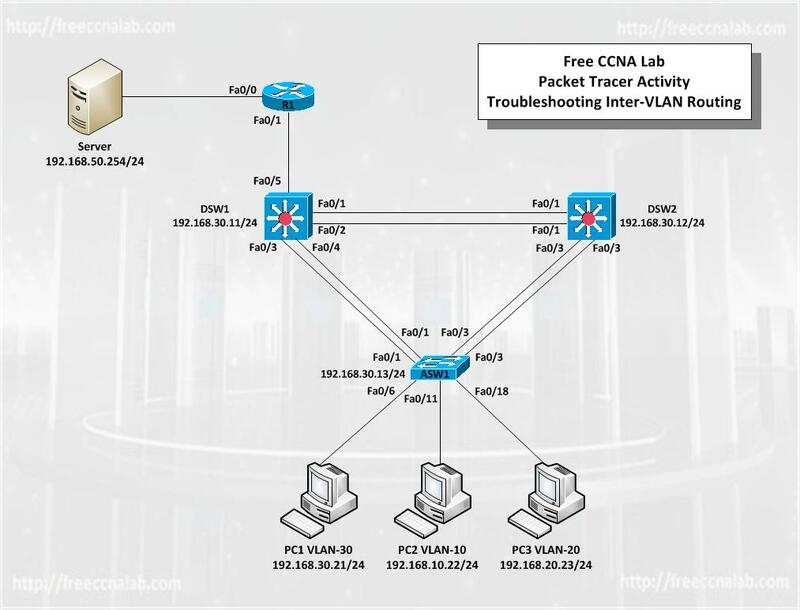 This lab is complete when you can demonstrate IP connectivity between each of the user VLANs and the external server network, and between the switch management VLAN and the server network. Erase any existing configurations and reload switches and the router to the default state. Load the switches and the router with supplied scripts. Find and correct all configuration errors. When pasting or typing in the scripts, did you get any console messages from the system? If so, what were they and what is the solution? Test and establish connectivity between devices. When all errors are corrected, you should be able to freely ping and telnet between R1, S1, S2, and S3. PCs should be able to ping each other and the server. Do you have connectivity between any of the devices? the results of your investigation and the solutions you implemented.